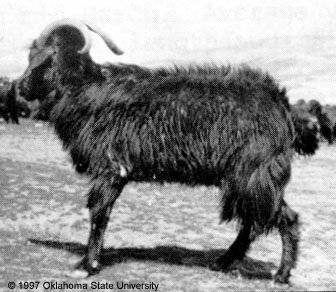 Black wool goats in Uzbekistan were produced as a by-product in the formation of the new breed - Soviet Mohair goats. Mating of predominantly white first and second generation crossbred females with purebred white Angora males resulted in the appearance of 1-2% of black kids. 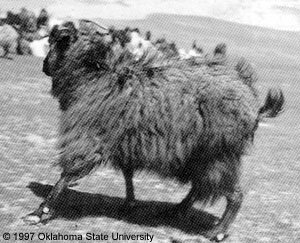 The black goats are similar to Don goats in such aspects as fleece structure, physical properties of wool fibres and productivity. In contrast to Orenburg goats, which have long guard hairs and very short wool fibres, Uzbek goats have wool fibres longer than guard hairs, except along the spine where the latter are very long. Hair is not shed in spring but wool is shed abundantly, starting from the first warm spring days when goats pass to grass feeding. Wool is combed out selectively at the time of moulting and, as a rule, only once, in mid-March. Average yields per head in collective farms vary from 280 to 440 g. While the length and fineness of fibres depend on the level and quality of feeding, wool yields are actually determined by the time of combing out the moulting fibres. Shedding is very rapid and 5-10 days delay in combing results in 20-40% loss irrespective of age. The extreme limits are 6 and 12 cm in females and even more in males. Fibre diameter is within the range 15-24 µm; the average for females is 19 and for males 22 µm. In the young, wool is 1-2 µm finer than in adults.